An opportunity to take part in actual archaeological field work A really close up way to come in contact with contemporary Russian culture as well as early Russian History. Contact us early each year to learn what digs are taking place and how you can join. We will help you make all arrangements for your stay in Russia. No experience is required to work on Russian Archaeological digs. Training is given on site. Bring a love of the outdoors, honest work and good company. Participants in archaeological digs will be given documentation by the dig leader detailing their participation in the dig. Work on Russian archaeological digs usually take place in extremely rural surroundings. People live in tents and sleeping bags. Tents are provided and if you don't want to bring your own sleeping bag that too can be provided. Bathroom facilities correspond to the period undergoing research. You will be fed 3 hardy meals a day and may even get to sample the mysteries of samogon (Russian moonshine). The company is guaranteed to be friendly and jovial. In the expedition there will always be someone who speaks your language and you will surely have a good opportunity to learn some Russian. Russian Archaeological Digs commence in early June and continues through late August. You would be welcome to join for as little or as long as you like. The work day is usually 8 hours (depending on weather) with a one or two hour lunch break. The cost, not including travel and transfers is about $15/day. This includes meals and camping equipment. Archaeological digs in Russia are conducted under full academic supervision. Mozhaisk, June, medieval city, uncovering layers of 12-17 centuries in search of a Finnish burial ground. Sleeping in tents at the edge of the town, 20 minutes walk from the site or in the hotel about 30-45 minutes walk from the site. 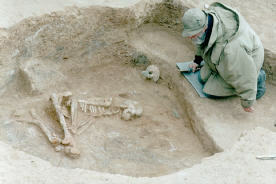 Krasnodar territory: Stone Age excavation in a mountainous but safe region. Sleeping in a cave in sleeping bags. A remote area, 15km to the nearest shop. In all expeditions – a personal assistant will help in everyday life and accompany in excursions. For free : friendly company, lots of work, nice views, curious natives, and visitors, sun and rain.